Charlize and I spent two days in the San Luis Valley trying to visit the places I identified while doing research for my historical novel MAN HUNT. The book is a fictionalized account of the intersecting lives of Tom Tobin, a frontiersman and the Espinosas, a family of New Mexicans. After the Mexican-American war the entire village in which they lived lost their communal property and became destitute. The Espinosas responded by turning to robbery, murder and a bloody vendetta against the Gringos. Many of the places mentioned in the book were identified and described in historical accounts and records made during the lives of these real people. Several years ago my wife and I visited Taos and passed through some of the places I talked about in the book, but at that time I had no idea I would be writing about those venues in the future. The reconstructed Fort Garland sits on the original site of that fort and some portions of the original buildings remain, along with historical records of what the fort actually looked like when it was an active army post. It was as I pictured it from my reading and study of existing drawings. The museum at the fort provides insight into the lives of the soldiers who were posted in that wilderness outpost. Charlize and I drove from Fort Garland south to Taos. Along the way I tried to identify the location of Tobin’s Trinchera ranch, but other than the general area where it was I could not identify a specific site. We passed through the town of Cochilla near where Tobin had a farm and kept his family. Nobody I asked knew where that farm had been located. The museums at the homes of Governor Bent and Kit Carson were as I remembered them from our previous visit. I drove several back roads around Arroyo Hondo and even stopped to ask some local folks if they could direct me to the site of Turley’s mill, a prominent landmark of the book. I couldn’t find it and those I asked couldn’t or wouldn’t help. Maybe they just didn’t want another nosey tourist poking around in their neighborhood. The next day we continued our hunt to identify some of the sites where the Espinosas did their deadly deeds, without much luck. Time and the new positioning of roads and highways have changed the landscape. 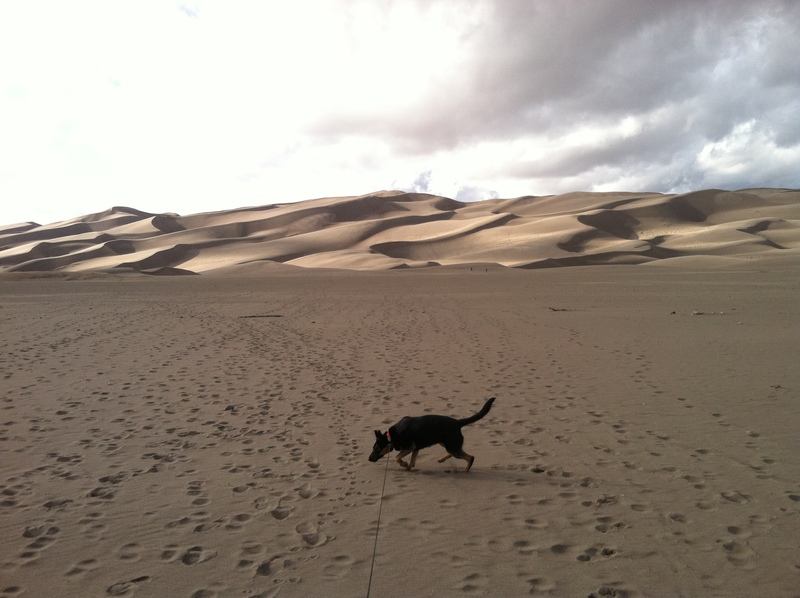 Late in the afternoon we gave up that activity and made a side trip to the Great Sand Dunes National Park. It was interesting and informative. The natural forces of water flow, wind, the location in front of a mountain range with the necessary configuration to direct the prevailing winds and the geological rift effect all combine to create and maintain a reasonably large area of pure sand dunes. The size and shape of these dunes are in a state of constant change. The largest dune is over seven hundred feet above the floor of the valley. Charlize considered the place nothing more than a huge sandbox for her to frolic in. The following day we drove over La Veta Pass and again I was unable to locate the landmarks described in my research on the nefarious activities of the Espinosas. This was explained on the eastern side of the pass when we saw a sign identifying the old La Veta Pass road. It took a different direction than the paved highway we were on and probably different than the wagon trail in use when Tobin was active in the area. The changes of landscape, experience and life style of the people who live in the various environments we pass through seem to be a recurring theme of this odyssey. It seems I to focus on the changes during my lifetime piled onto the historical changes I have read about. Perhaps this is not so unfortunate. I find thinking about places and the events that occurred in those places in the past more comfortable. I don’t have to deal with things as they are now. As many have said to me and I have repeated too many times to count; growing old ain’t for sissies.